I have been trying to connect flexmonster to the xmla interface of the mondrian server embedded within Pentaho BI 8.0. I can confirm the interface works as I have connected to it from other clients. Flexmonster keeps telling me the url is incorrect and I have hit a brick wall. Should this be something else? Your proxyUrl looks correct. 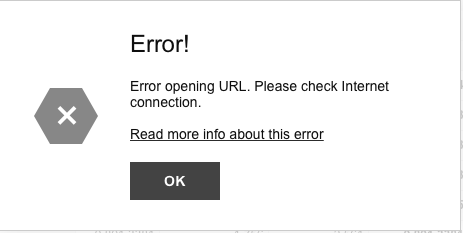 Could you please provide us with the exact error or message you see? Please let me know if CORS was the reason of the issue. We have added CORS to the web.xml file and the error still occurs. This does not seem to be the solution. I do not get a stream error like the thread you posted I get what you can see in the image I attached. Could you please check whether you have any errors in the browser’s console? If yes, we kindly ask you to share them with us. Thank you for sharing your errors with us. Our team wants to suggest you an alternative approach. Configuring connection via XMLA protocol can be tricky. Also, it’s no secret that the XMLA protocol takes too much time and memory to load and process the data. We suggest trying Flexmonster Accelerator for Pentaho Mondrian cubes. This is a special server-side proxy that helps you to increase data loading speed from server to customer’s browser because it uses direct requests from the Component to a server.